Roof.info reviews many types of roof shingles: from popular styles such as asphalt shingles and metal shingles to more specialized options such as tile, rubber, aluminum, architectural, and solar shingles. In addition, you can find in-depth advice about roofing, such as how to choose a roofing contractor, which type of gutters to choose, profiles of different types of gutter guards and advice on solar panels. 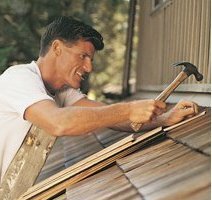 Need information on roofing contractors in your state? We have collected information on each state, from legislative requirements and consumer protection resources to how the climate of a state affects the roofing needs of its residents. Also, the Roof.info has partnered with a number of companies that provide free roofing quotes from pre-screened, licensed and insured roofers. Try it now! It's quick, easy and free! Solar panels are becoming an important addition to roofs around the world. While solar shingles may represent the cutting edge use of solar cells, solar panels are becoming increasingly inexpensive and reliable.